Control is the base type of user interface controls. It receives input events from the window system, and paints a representation of itself on the screen. The implicitWidth and implicitHeight of a control are typically based on the implicit sizes of the background and the content item plus any padding. These properties determine how large the control will be when no explicit width or height is specified. The background item fills the entire width and height of the control, unless an explicit size has been given for it. 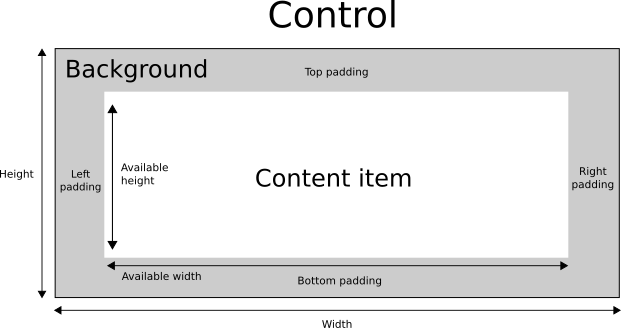 The geometry of the contentItem is determined by the padding. All controls, except non-interactive indicators, do not let clicks and touches through to items below them. For example, if Pane is used as the header or footer of ApplicationWindow, items underneath it will not get mouse or touch events. See also ApplicationWindow and Container. This property holds the height available to the contentItem after deducting vertical padding from the height of the control. See also Control Layout, padding, topPadding, and bottomPadding. This property holds the width available to the contentItem after deducting horizontal padding from the width of the control. See also Control Layout, padding, leftPadding, and rightPadding. color: control.down ? "#d0d0d0" : "#e0e0e0"
This property holds the bottom padding. See also Control Layout, padding, topPadding, and availableHeight. This property holds the visual content item. Note: The content item is automatically resized to fit within the padding of the control. Note: Most controls use the implicit size of the content item to calculate the implicit size of the control itself. If you replace the content item with a custom one, you should also consider providing a sensible implicit size for it (unless it is an item like Text which has its own implicit size). See also Control Layout and padding. This property determines the way the control accepts focus. Qt.TabFocus The control accepts focus by tabbing. Qt.ClickFocus The control accepts focus by clicking. Qt.StrongFocus The control accepts focus by both tabbing and clicking. Qt.WheelFocus The control accepts focus by tabbing, clicking, and using the mouse wheel. Qt.NoFocus The control does not accept focus. See also Item::activeFocus and visualFocus. This property holds the font currently set for the control. This property describes the control's requested font. The font is used by the control's style when rendering standard components, and is available as a means to ensure that custom controls can maintain consistency with the native platform's native look and feel. It's common that different platforms, or different styles, define different fonts for an application. specifying the fonts in the qtquickcontrols2.conf file. Finally, the font is matched against Qt's font database to find the best match. Control propagates explicit font properties from parent to children. If you change a specific property on a control's font, that property propagates to all of the control's children, overriding any system defaults for that property. For the full list of available font properties, see the font QML Basic Type documentation. This property determines whether the control accepts hover events. The default value is Qt.styleHints.useHoverEffects. Setting this property propagates the value to all child controls that do not have hoverEnabled explicitly set. You can also enable or disable hover effects for all Qt Quick Controls 2 applications by setting the QT_QUICK_CONTROLS_HOVER_ENABLED environment variable. This property holds whether the control is hovered. This property holds the left padding. See also Control Layout, padding, rightPadding, and availableWidth. This property holds the locale of the control. It contains locale specific properties for formatting data and numbers. Unless a special locale has been set, this is either the parent's locale or the default locale. Control propagates the locale from parent to children. If you change the control's locale, that locale propagates to all of the control's children, overriding the system default locale. See also mirrored and LayoutMirroring. This property holds whether the control is mirrored. This property is provided for convenience. A control is considered mirrored when its visual layout direction is right-to-left; that is, when using a right-to-left locale or when LayoutMirroring.enabled is true. See also locale, LayoutMirroring, and Right-to-left User Interfaces. This property holds the default padding. See also Control Layout, availableWidth, availableHeight, topPadding, leftPadding, rightPadding, and bottomPadding. This property holds the palette currently set for the control. This property describes the control's requested palette. The palette is used by the control's style when rendering standard components, and is available as a means to ensure that custom controls can maintain consistency with the native platform's native look and feel. It's common that different platforms, or different styles, define different palettes for an application. specifying the colors in the qtquickcontrols2.conf file. Control propagates explicit palette properties from parent to children. If you change a specific property on a control's palette, that property propagates to all of the control's children, overriding any system defaults for that property. For the full list of available palette colors, see the palette QML Basic Type documentation. See also ApplicationWindow::palette and Popup::palette. This property holds the right padding. See also Control Layout, padding, leftPadding, and availableWidth. This property holds the spacing. Spacing is useful for controls that have multiple or repetitive building blocks. For example, some styles use spacing to determine the distance between the text and indicator of CheckBox. Spacing is not enforced by Control, so each style may interpret it differently, and some may ignore it altogether. This property holds the top padding. See also Control Layout, padding, bottomPadding, and availableHeight. This property holds whether the control has visual focus. This property is true when the control has active focus and the focus reason is either Qt.TabFocusReason, Qt.BacktabFocusReason, or Qt.ShortcutFocusReason. In general, for visualizing key focus, this property is preferred over Item::activeFocus. This ensures that key focus is only visualized when interacting with keys - not when interacting via touch or mouse. See also focusReason and Item::activeFocus. This property determines whether the control handles wheel events. The default value is false. Note: Care must be taken when enabling wheel events for controls within scrollable items such as Flickable, as the control will consume the events and hence interrupt scrolling of the Flickable.